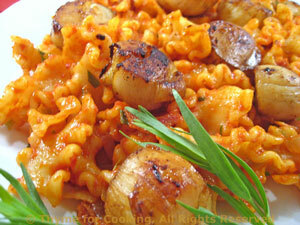 Seared Scallops on Tomato Tarragon Pasta, Thyme for Cooking seafood. The scallops can be cooked on the grill or quickly pan-fried in a hot skillet. They release a lot of liquid when cooked, so be careful not to crowd. The paprika adds both flavor and color. Use a grill pan or basket for easy handling and be careful not to overcook. Rinse scallops and pat dry. Mix oil and paprika. Add scallops and stir to coat. Grill over direct heat 3 - 5 minutes per side, just until they are opaque. Note: Could also be quickly sautéed in a nonstick skillet over medium high heat for about the same amount of time. Pasta: Cook pasta according to package directions. Drain. Heat 2 tsp oil in a small saucepan over medium heat. Add onion and sauté until tender. Add Prosciutto and sauté until crisp. Add tomato sauce, vinegar, tarragon and heat through. Keep warm until needed. To Finish: Combine drained pasta with tomato sauce. Divide pasta onto two plates. Top with seared scallops and serve.